Sergei Mironov’s poor showing in the presidential election may result in his ouster from the leadership of the Just Russia party, and maybe from politics altogether. In last week’s presidential election, Just Russia leader Sergei Mironov did worse than even he expected. And as the left-leaning opposition looks to merge to create a more robust competitor to the establishment, Mironov may find himself shown the door. Infighting has been raging at Just Russia for months. While one part of the party is participating actively in the protests for fair elections, another segment continues to stand firmly behind the Kremlin, which initiated the founding of the party. Just Russia came into being in 2006 as a merger of the Russian Pensioners’ Party, the Party of Life and Rodina. It was an attempt by the Kremlin to form a social-democratic party as a counterbalance to the center-right party of power United Russia. The role of chairman was bestowed on Putin-confidant Sergei Mironov, who was at the time the head of the Federation Council and nominally the third-most important politician in Russia. This attempt at creating a two-party system based on the U.S. model failed in the end because in 2007 Vladimir Putin decided to head United Russia’s State Duma list, sending a signal to many key officials to turn their backs on the smaller Kremlin party. Nevertheless, Just Russia remained pro-Kremlin. It was not until the 2011 State Duma election, when the party wondered if it would even pass the 7 percent threshold necessary for remaining in the Duma, that Just Russia sharpened its opposition profile. Party spokesperson Oksana Dmitrieva and deputies Gennady Gudkov and Ilya Ponomaryov attacked the ruling caste of officials during debates, and were rewarded by the voters. In December, many protest voters selected Just Russia candidates. Mironov, however, did not favor this tactic and renounced Gudkov’s views as his own and not representative of the party. 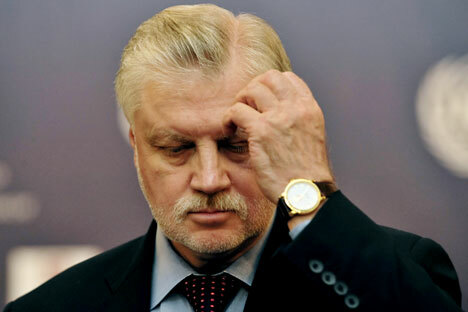 As party head, Mironov was entitled to run as the presidential candidate for his party, and did so, but announced that he was still a supporter of Putin. Not surprisingly, he came away with 3.8 percent of the vote. Many experts suggested that either Dmitrieva or Gudkov would have been a better candidate than the colorless apparatchik. Now, moving forward, the party faces a turning point. “For us, it’s a matter of life and death. If we don't join up with other leftist parties now, Just Russia will simply be destroyed. The party cannot have a leader with a rating of only three percent with the people,” said a highly placed party member in an interview with Russian daily Izvestia. In the party member’s view, the party rank-and-file were disappointed Mironov’s positions during and after the election. On election night, Mironov said he had predicted the extent of Putin’s election victory. Mironov said Putin had taken up the campaign positions of Just Russia he advised party members not to take part in the demonstrations. Gudkov in particular sees Mironov’s actions and his poor showing as an indication that the party leader’s time has passed. “The presidential election has shown that the people want to see new faces. The many votes for Putin are a sign that the existing opposition candidates are only a credible alternative for a few people,” Gudkov said. According to him, a plan is currently in the pipeline for a merger of Just Russia with other leftist forces – both those inside and outside the parliament – including possibly the Communist Party of Russia, whose leader Gennady Zyuganov also performed worse than expected in the presidential poll. This article first appeared in Russland Aktuell.